The latest death occurred today when a cyclist was killed after being hit by a truck in Newcastle. Five people have been killed in Queensland, three in NSW, three in Victoria and one in WA. 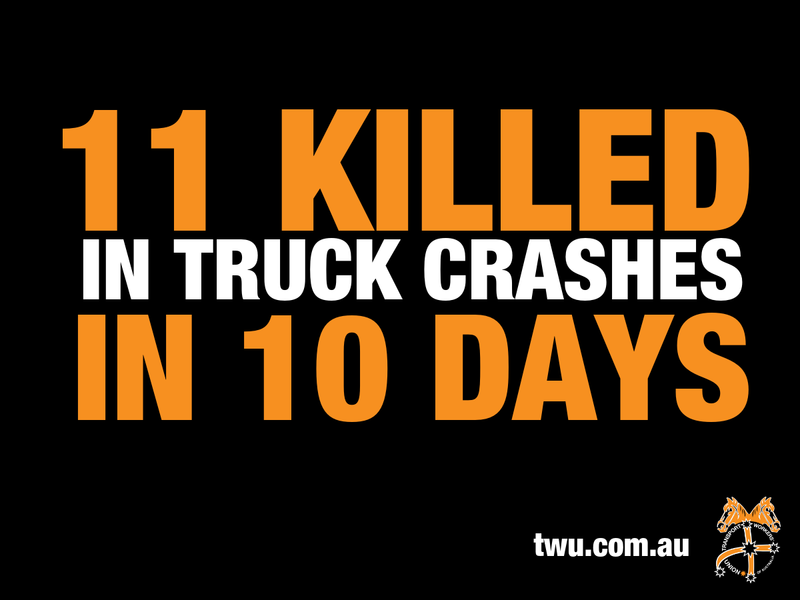 Five truck drivers are among the dead. Truck drivers will hold a convoy in all major capitals on March 31st to protest about the high number of deaths and lack of Government response. “It is almost three years since the Federal Government tore down a road safety watchdog which was investigating risks to safety in trucking. Since then 523 people have lost their lives in the most horrific and violent way. Families and communities have been left devastated. We think of them every day and we mourn the fact that many died in preventable crashes. The watchdog was examining the pressure on truck drivers to speed, work long hours and skip breaks and it was examining ways to combat the risks. The Federal Government refuses to even acknowledge the dead let alone admit that it got it wrong,” said TWU National Secretary Michael Kaine. “There is a positive move happening to address the problems in transport: the transport industry is coming together to work out a solution. Just yesterday the various industry bodies met in Canberra to discuss the best way to move forward and implement a system to ensure safety is the number one priority. This will involve holding wealthy companies at the top to account over low cost contracts which put financial pressure on transport operators to cut corners in safety. It will involve binding federal regulation to ensure fairness and safety,” Kaine added. A Department of Infrastructure report has said: “Heavy trucks are disproportionately involved in casualty crashes: approximately 16 per cent of road crash fatalities and 4 per cent of injuries involve these vehicles.” This compares with trucks making up just 3.6% of registered motor vehicles, according to ABS data. A series of studies by Monash University has shown that: Trucking is Australia’s deadliest job, with drivers 13 times more likely to die at work than any other profession. The job is also one of Australia’s unhealthiest with over 1 million weeks of working time lost over a 12-year period. A 2019 report by AMP showed: 25% of transport workers are suffering from financial stress. This is the highest rate of any industry.